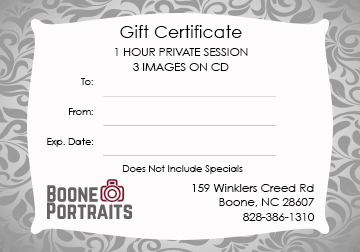 Purchase your Gift Certificate at Boone Portraits! Larger sizes and canvas prints also available upon request. $49.99 for 3 high resolution digital images. Each additional image is $10. $50 offsite fee for locations within 10 miles of Boone. If your location is more than 10 miles away, please call us for a quote. $75 for every 15 minutes in a session, with all pictures digitally. Designed and hosted by Overmountain Studios Inc.